Four girls of the band “Sympathy” are performing a set of original songs at a popular live house in Osaka. 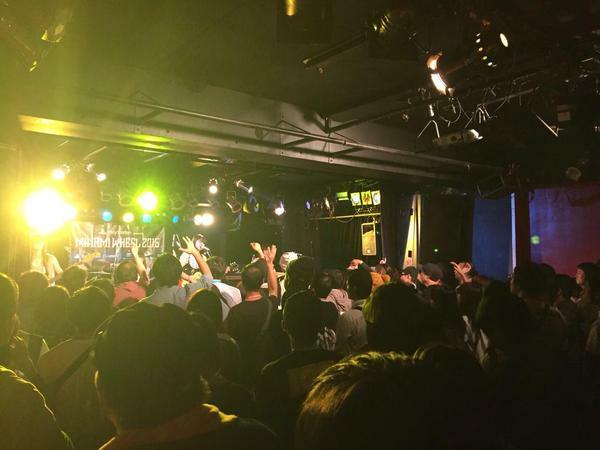 The audience is made up of about 200 people from the Kansai, Nagoya, and the band’s hometown of Kochi. Everybody is smiling and swaying to Sympathy’s music. The member are Yu Shibata (Vo and Gt), Kayana Taguchi (Gt), Natsuki Imai (Ba), and Tomoka Kadomasu (Dr). Though they are still amateur, many people come to the live house and listen to their songs because the band has been gathering attention. “It is a Friday night, so please enjoy our music until the end.” Yu says. For people who form a band, a major debut is really big dream, and the number of bands that can have a major debut is only about three to four hundred a year. And of these ninety percent give up within a short time. But Sympathy is running up the stairs of debut and breaking into real stardom step by step. But why the name Sympathy? They have performed live over 20 times since high school. For them, live performances are really important because they can deliver their songs to audience directly. “But we have had only three live performances this year. Only three! It’s really small amount.” Kayana said. They attend different universities now but had their start at a local high school as freshmen in the “Folk Song” club. (“Folk song club” is a club activity for people who want to form a band or play music.) They met in the club and formed Sympathy. They entered a few music competitions when they were still high school students: Music Revolution, OSM Osaka School Music, a local festival of bands in Kochi, and took prizes at all of them. Surprisingly they got a 1st prize on their very first competition when they were freshmen in high school. Their Cinderella story had already started when they were high school students. “It was really natural for us to be Sympathy.” Tomoka said. The common thing between them is that they want to form a band. When they were high school students, they could meet and practice together every day at school, but now they practice separately and individually. “These days… it’s like a long distance relationship, but we talk a lot, because we are really close friends. That’s why we can be Sympathy even if we can’t meet so often.” Kayana said. ‘I belong to “folk song club” at University, so I can practice there.’ Tomoka said. “And I go to music studio in Kochi and practice there.” They are separate in distance but their common feeling is same –sympathy is the best. Yu and Kayana have made original songs since they were high school students. “We usually do LINE or Skype to make a song.” Kayana said. “And we want to challenge making English lyric songs in the future.” They look really happy when they are talking about their own future. “We were worried about doing interview because we are not special.” Kayana said before doing an interview. They have already released two CDs and belong one big label company, but they are really modesty. The label is CONNECTONE of Victor Entertainment which is really famous in Japan. A lot of popular musicians belong to this agency. 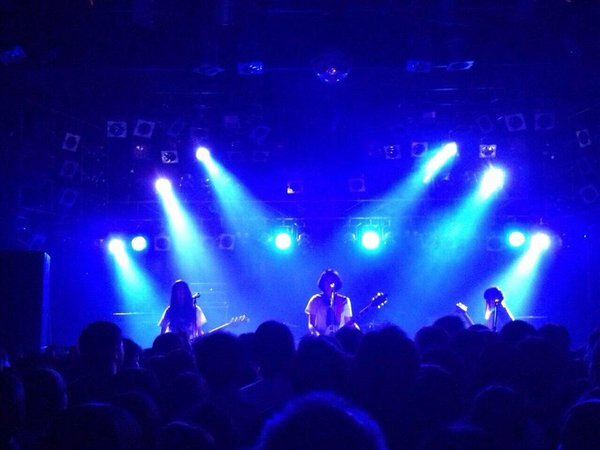 In 2014 August, Sympathy had a gig in Tokyo and the head of Victor came to the show and was interested in them. “It was really great coincidence because the head came to see another artist.” Kayana said. Then they decided to belong to the label soon. They got a big chance to debut just they had only one gig. They are going to join the one of the biggest rock festival in Japan, “SANUKI ROCK COLOSSEUM ～BUSTA CUP 7th round～” in March 20th 2016 in Kagawa prefecture. So many famous Japanese artists will join this festival as well. This is the first time for them to join this rock festival and it’s a really good opportunity because so many people can listen and see their performance. “I feel a little bit nervous… but we’ll do our best.” Tomoka said. “We decided to be Sympathy and work hard as Sympathy.” Tomoka said. “We want to do band activity with these 4 members forever and also want to be a big.” Kayana said. They really like their songs and activities. They are promoting “Yureru-Rock”. “Yureru” has two meaning for them. Firstly, they make songs that listeners can sway their body when they listen sympathy’s song. Secondly, they want listeners to move by their songs. They will be big artist from now on, but Kayana said “We are not special, just normal girls.” From Kochi, one big star might be born. I’ve been to their concert when the all members were still in Kochi. I remebered the concert, and wanted to see them again! I was surprised that Kayana thought the members of Sympathy normal, not special, because I thought those people such as artists special, rich, and talented. I am happy to know that even such artists are human. I’d love to hear their songs and I always adore the girl-bands (look at them, so cute and absolutely talented!). It’s a solid proof that girls also can play guitar, bass and drum, not always in the vocalist position or playing a ‘feminine’ instrumental such as flute or piano. I was very surprised because they are maybe my junior. I had never heard them before, but their songs are powerful and pure, so I like them. Kayana said their normal. I think it is correctly, but sometimes wrong. I know that many people were in folk song club and in Japan, they practice harder to survive competition not only in school but also now. They have special luck, power to effort and clear dream. I got the energy to effort to grant my dream. I want them to do their best in the future. As a girl who likes Japanese Band, I’ve heard lots of songs of Japanese Band. Some bands imitate other bands a lot, so their songs were little bit boring for me. But “Sympathy” has their own color and I like the style of their music. It is not boring at all. My favorite song of “Sympathy” is “ナイン・トゥ・ファイバー”. I like the lyrics of this song and the way of singing. My friend introduced this band for me, and I really love to listen to their song and became fan. I’d like to go their live some day!